I have been very hesitant about making a go fund me page, mainly because these struggles are happening and this is such a public platform. Many people have recommended that I started this a month and a half ago. I haven't made one up till now because I thought there would be a way for someone to help me but after two months of trying, I have gotten nowhere. Just know that I am only doing this because I am running out of options very rapidly. If you know me, you would know: My husband and I are combat veterans, both honorably discharged. We have three minor children 11,10, & 3. Approximately two years ago we decided to make some serious changes, and find our family's forever home. Then we started looking for homes. We looked at foreclosures, 203k loans, and researched everything we could. Then John started having seizures. We narrowed our options to our VA HOME LOAN, the strict program says every single veteran I have spoken to. John and I could not handle the details of buying a new home or remodeling a home because we were dealing with lots of issues both individually as veterans much less our marriage was struggling. We've both returned within the last decade. Then we found it. "Country living at its best! 3.5 gorgeous acres w/many mature shade trees, surround this attractive country home! Main fl mstr bdrm w/walk-in closet, 2 full baths, 3 lg upper bdrms, great open floor plan includes over sized lvrm, lg open dining area, and open kit w/an abundance of storage! This home is ready to move right in! Updates included siding, insulation, windows, baths, flooring, furnace & more! Looks and feels like new! Handy king size main floor laundry also doubles as a mud room for your outdoor clothing! Full dry bsmt for storage. The detached garage is plenty big enough to store all of your vehicles and toys. This is just a great home at a reasonable price. Call today, take a look then get ready to move!" So we go look at it, and we love it. It's so beautiful. Everything looks wonderful. No changes to anything. Everything went through just fine. The cover photo was the last day we were in our other house. WE WERE SO HAPPY. It only takes a couple of weeks before things start to not add up. Propane ran out the first time we used the heater. That is when we started noticing the electrical problems. The bottom trim had to be taken down so that the floating floor could be trimmed down on every side because it was making giant bubbles under the flooring. We actually had to put separators in the doorways because it wouldn't stop bubbling. My house would look like a skate park. We filled the propane. The electrical progressively get worse, and the water is starting to smell like sewage. I ask many people about the water, they confirm the smell is sulfur. We never drank it, but we did cook with it and bathed with it. Until... One night I was draining my 3-year-old son's tub, and there it was sewage coming back into the tub. The toilets starting gurgling, the stand-up shower in my second bathroom backed up as well as my kitchen sink. The best septic tank company ever dug up a fuel oil tank in the side of my yard. It is draining in the side of my home. That was draining in the yard less than 10 feet from my house. And this is where it just starts cycling out of control. Somehow there is no wellhead. Oh, how? No idea, on a VA HOME LOAN this is not allowed. My home's certificate of occupancy is dated for 9-28-2018. How is this if my home was purchased on 4-4-2018 on a VA home loan through a highly reputable veteran lending institution. This was two months ago. So we called someone scheduled a septic system installation. We have an open permit on hold till we determine the extent of the damage so we can use our limited resources appropriately. If the house has mold, an apartment will be more important than a septic system. We had a friend look at our electric and he said I need a licensed electrician to come out and look at my home. It needs immediate attention. I haven't done this yet, but it is on this week's agenda. My aunt was cleaning off the stove with a wet rag and wiped the hood fan. She was electrocuted. It arcs. All the GFIs pop. I plugged a fan in the dining room one night and woke up late because that can shut down a circuit that is connected to a GFI on my porch then routes up to my daughter's room upstairs. We need a licensed contractor to come out and look at my walls and bathrooms because they are breaking and falling apart. We discovered double hung drywall. The foundation is starting to crack. My cupboards even smell. I have tried to clean it out with Murphy oil, and cleaners. It still stinks, can only be massed. We are now starting to use more and more of our credit. We are running out of funds to keep going. We have enough credit for the septic system, but now things are just falling apart from the inside out. We don't know how this happened. I have contacted many people, lawyers, judges, commissioners, inspectors, VA loan guarantee department, lienholder. This is why we chose to go with a VA loan. We followed this process. We even used a preferred realtor with our lienholder. No one I have talked to has ever heard of this happening. I have been praying, investigating, and reporting as much as I can to where I should. My lienholder has advised me to report to authorities, which I have done. All the money raised will go towards the whole process of this event. Since he cannot drive this time till February, it is just so overwhelming. The money will be used for everything that we may need, the testing, the professional help that we so desperately need, the remediation of all problems with our home and/or reconstruction, lawyers fees or any kind of related expenses. We will be using any money raised to do things like buying bottled water, and the laundromat because I haven't gotten the water retested yet because of our limited income. Every time this is read and shared I appreciate it more than people know. Before I am done, I want to thank you. I want to thank every single one of you, personal friends to complete strangers, who have listened to me cry. You have no idea how much you mean to me. I am making it. Some days I don't know how. I just wanted to include this in here. All the ladies who work for my lienholder, bless your sweethearts. You have listened to me cry over and over as this whole thing unfolds. Thank you for being there for me and my family. I will keep updating on here. Thank you for listening. Thank you for sharing. Ashley Levesque. So I met with my last attorney on Monday, after laying it out all on the table this kind of thing happens every day in the closing offices. Obviously I have a case, but I could lose. Plus with my limited resources and the fact that attorneys don’t work for free (nor do I expect one to, I paid for almost every consultation) we have decided that at this point with cannot afford to chance it. With the problems we have with the house we will just have to wrap it up. My complaint with the state police was returned with no crime was committed. I am so absolutely upset ❤️, but it will be okay. I didn’t start therapy for nothing. What I want to share with you what I have learned. Just because you may follow the credit building advice, work really hard, and get ready to buy a house, reality is the real estate market is always a BUYER BEWARE market. I would highly advise never using a preferred Realtor through USAA, since it is another program they just sign up for in order to get clients or so I have heard. Instead I would research your Realtor and theirs. Always advise with counsel if you don’t know what you are doing. If you decide to buy a property that was flipped by the person you bought it from, I highly recommend that you pull your county permits before you decide to purchase. If it is cost effective for an inspection, than it is cost effective for an attorney to advise you as well. What is another couple hundred when you are purchasing a house. Lord knows if that would of been on my checklist of things to do, I would of done it. Since I did follow every little thing, like an inspection. I did do a few other things that may at least make someone answer for something, but at this point it is time to move on. I got the estimate to clean up the basement and the bathrooms. It's almost $8500 to take out my bathrooms (not put back in) and to clean up the basement. Of course not until the septic is in, can this even be done. Still definitely working hard. About to be working even harder. Thanks for the shares and support. I am actively looking for counsel. Find me on Facebook and shoot me a message if you know of any. Thank you to all for your prayers and support. The holidays are over, and the new year has begun. Still diligently working to get things squared away. We do have a few things up for sale on the marketplace, so that has been useful. We also have begun to get all our estimates in. We have already paid for mold testing, $792.00. The basement and the bathrooms need to be addressed so the estimates for that should be in soon. The water testing determined the hardness of my water is caution, so we installed a temporary filter on our water line. We have gotten the estimate for the drilling of the new well instead of the crock well we have in the basement. That will be $6678.00. 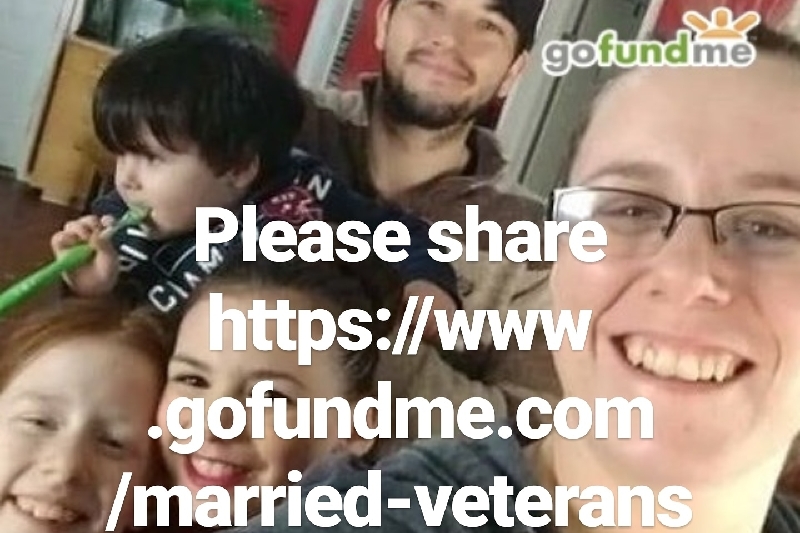 I have received a lot of support and direction because of this gofund me page. I am grateful for all the shares, and the ideas.